War for Science: Throwing Molotov Cocktails doesn't improve your rating, extremist Muslims. Throwing Molotov Cocktails doesn't improve your rating, extremist Muslims. If anyone hasn’t heard of the “Allah” word controversy in Malaysia by now, I’ll give an brief introduction. So a Bible was written in the Malay language, and it used the word “Tuhan” for “Lord”, and “Allah” for “God”. Not surprisingly, this raised quite a number of objections by the Muslim community, and the Malay Bible was banned initially. Yet the Court lifted the ban after that, and said that the word “Allah” is free for use by other religions (with the term that a warning that the book was for non-Muslims be placed on the cover of the Malay Bible). Now this sparked a great controversy in Malaysia. As the fights (on paper) went on, a few fanatics decided to take it one step further, and voila, there have been 8 churches under attack from Molotov cocktails so far. Oh the humanity. 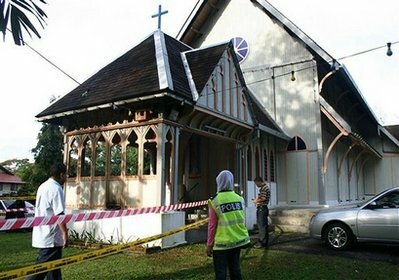 Jan. 10: Police officers inspect damage at the All Saints Church in Taiping of Perak state, Malaysia. Seriously, what’s this all about? Firstly, the word “Allah” is the Arabic term for “God”, and has been in use since pre-Islamic (aka pagan) Arabia, in which it referred to the creator-god, and is still in wide use by Arabic Christians/Jews. Why the controversy? Secondly, it is surprising that there are guys who think that by throwing Molotov cocktails at churches, they are fighting for Islam as a whole. Please. You extremists are most certainly embarrassing the Islamic religion, your much more rational/moderate Muslim peers, and Malaysia. Lastly, I’m still waiting for the mullahs around the world to give their opinions on this issue. So far, there’s none. Alright, enough of my rants. I’m going to write about science in my next post. I promise. Anyway, what’s your opinion on this topic? That reminds me of that scene from Life of Brian where the old guy is about to be stoned for saying God's name. His response to the charges: "Look, I had a lovely supper and all I said to my wife was that piece of Halibut was good enough for Jehovah!". True, Freddy. It's just so irritating that even in the 21st century, people are willing to loot and kill over trivial things such as names.